New Hyde Park high school funds come on heels of years of disinvestment, as South and West side schools continue to struggle for resources, supports. CHICAGO, September 11, 2018—As Mayor Emanuel works to shore up his failed education legacy, today’s announcements on student outcomes and new investment in an iconic south side high school underscore shortcomings in eight years of his education policy, says the CTU. Sharkey also raised concerns about CPS’ press release today on student achievements. 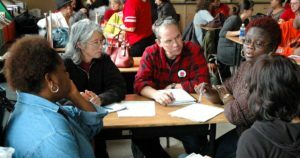 The CTU successfully pushed CPS to pilot 20 sustainable community schools this fall, as a goal toward creating a city-wide sustainable community school district. Those schools are supposed to receive hundreds of thousands of dollars in extra resources to provide educational resources and wrap-around supports for students and families. But the data CPS released today fails to address what kinds of experiences young people are having in their schools. Metrics that show rising test scores or increased graduation rates do nothing to make schools more engaging, or culturally relevant – nor do they truly help students actually succeed after graduation, charges the CTU. 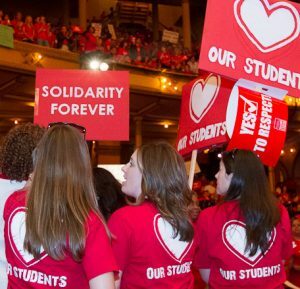 The CTU has long argued that students are more than a test score – a position supported by research that also points to the critical need to provide additional supports to students from poor and working class families, who comprise the vast majority of CPS students. Yet Emanuel has ignored the state’s equity-based school funding formula, instead using his ‘student-based budgeting’ scheme, which provides a flat dollar amount to each school based on enrollment. That approach undermines real educational equity and intensifies a two-tiered ‘separate and unequal’ school district that disproportionately hurts neighborhood public schools in disenfranchised communities. Today, most schools still have no librarian, while social workers carry caseloads four times the recommended number and schools confront chronic shortages of special education services, clinicians, school counselors, teacher assistants and classroom resources. CPS’ reference to their “supportive schools certification”, which they claim 75% of schools earned despite meager resource support from the district, stands in stark contrast to how CPS as a district meets NONE of the support staff ratios recommended by national and state professional clinician councils. 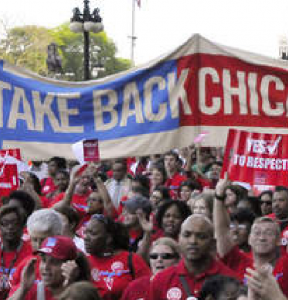 The CTU also raised concerns about CPS claims of its ‘safe passage’ program at some schools. At Aldridge on the far south side, for example, sometimes as many as a dozen Chicago cops police students as they enter school and move from class to class. That kind of practice, charges the CTU, over-polices and criminalizes youngsters at a cost of millions of dollars a year to the schools, with virtually no oversight or accountability. Instead, CPS should fund social workers, school nurses, libraries with librarians, CTE programs, wrap-around supports, enrichment programs, smaller class sizes, adequately resourced classrooms, culturally relevant curricula – all of the components that students in more affluent neighborhoods have come to expect from select north side public schools, and that set the stage for educational and socio-emotional success for students. The City of Chicago’s Inspector General is expected to release a report on policing in Chicago’s public schools on Thursday.